Customers who subscribe via your store's newsletter forms will have their email added to the Customers section on your store admin under the Customer accepts email marketing tab. To connect your customer email marketing list with Mailchimp you will need to install the Mailchimp for Shopify app. For further instructions on how to set up lists within Mailchimp, visit their docs on how to use Mailchimp with Shopify. Blockshop has three optional areas for newsletter sign-ups — in a Storefront Section, in the Footer and in the Popup. For the section on the storefront, the text can be configured in the Newsletter section. Read more about changing default theme text. 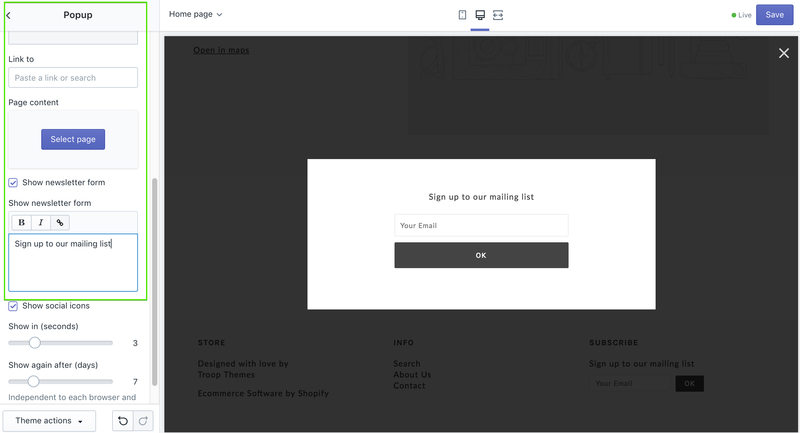 Maker has two optional areas for newsletter sign-ups — in a Storefront section and in the Popup. Local has two optional areas for newsletter sign-ups — in a Storefront section and in the Popup. Read more about configuring marketing features.